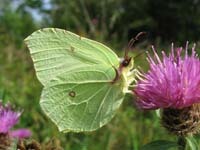 Irish Butterflies - Butterfly Species - White/Yellow Species. This group consists of Whites and Yellows. It contains some butterflies which are regarded as pests. The Small White and the Large White are not popular butterflies, as their caterpillars feed on cabbage plants. These species, along with the Green-veined White are very common in Ireland. Click on the species name for full details.